Ahead of the 2016 Copa America Centenario, the tournament’s trophy will visit Northern California from Friday, Apr. 22 through Monday, Apr. 25 as part of a national trophy tour celebrating the 100th anniversary of the historic tournament. The trophy will make an appearance at Republic FC’s match against Saint Louis FC on Saturday, Apr. 23 at Bonney Field, with additional stops in San Francisco, San Jose and Santa Clara. Fans will have the opportunity to take photos with the trophy before the match and during halftime. Gates for the match open at 6:00 p.m., with kickoff at 7:30 p.m. The 2016 Copa America will open on Friday, June 3 at Levi’s Stadium when the United States Men’s National Team face Colombia at 7:30 p.m. Levi’s Stadium—which was designed by HNTB, the same architects designing Republic FC’s MLS stadium—will host several Copa matches. The other matches held at Levi’s Stadium include a rematch of the 2015 Copa America final between Argentina and Chile on June 6, Uruguay vs. Jamaica on June 13, and a quarterfinal match between the winner of Group C and the runner-up in Group D on June 18. Tickets to Republic FC’s match on Apr. 23 are available at Ticketmaster.com. 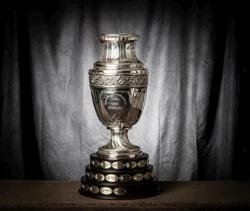 For more information about Copa America Centenario, the trophy or to purchase tickets to the tournament visit ca2016.com.